Here at New Song, a community of volunteers serve on teams to help others experience God's love. in real relationships with Jesus Christ; that's our mission. When you volunteer, you become part of that mission! Joining a team is easy! Take a look at some of the teams listed below and let us know if you'd like to be a part of one! ​Our mission is to encourage and support individuals and families during life changes. As the New Song family grows, so do the needs of those in the community. 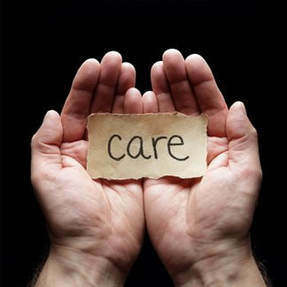 The Care Ministry welcomes anyone who has a heart for people and wants to make a difference in the lives of others. Being part of the Care Ministry could mean: a hospital visit during the birth of a child or a time of illness or recovery, sending a card to a family or individual letting them know that they are being thought of and prayed for, making a phone call to see if someone can use our help. The Care Ministry shows compassion and lifts spirits! Join our team- we need you! Each Sunday, the Connection Center Team serves our visitors and guests by providing a central point for answering questions, providing information, and pointing people in the right direction. 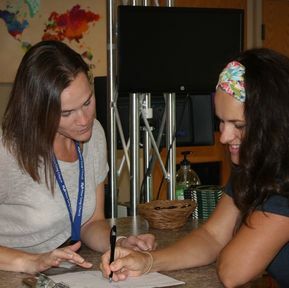 Within a spirit of neighborliness, the Connection Center is a place for community-building where we invite everyone to learn about the Church's ministries and connect closely with God. The Connection Center is located in the Commons (lobby) and is staffed from 8:45am to 12:00pm on Sunday mornings, in addition to special services. We'd love your support for this opportunity! It's a great way to learn more about the church and to meet other people here at the Church and from the community. This highly dedicated (and very popular!) group of volunteers helps make sure we have coffee available every Sunday morning! 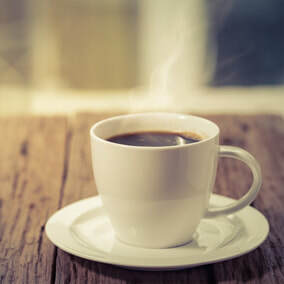 Something as small as cup of coffee ends up providing an opportunity to meet with new and existing friends, so we feel it's important to make sure this step is boldly taken... get it? Volunteers help on a rotating basis to set-up and clean-up the coffee stations on Sunday morning that are located in the Commons. This groups runs year-round on Sundays and, if available, during special events and services. Volunteers are always trained on our equipment and the routine prior to being scheduled to take the lead on their own, so never fear - training is here! Sign-up today! Our Hospitality Team is the best in the business… they run a top-notch, restaurant-quality kitchen – all on a shoe-string budget! If you enjoy the art of preparing meals, setting-up and cleaning-up for events, and putting the Church’s best foot forward through food, faith and fun… well, this is where we need you! Meals and events of all varieties are our specialty. Our ministry is one of grace, gratitude, service and meeting needs. 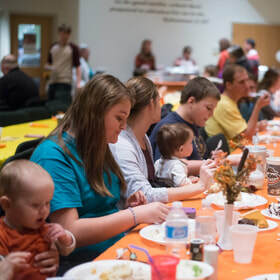 We love the opportunity to share the love of Christ with others, be it at our Thanksgiving Supper, during Family Fun Week, a fundraiser, or even a Church picnic. Nearly every time something huge happens in the Bible – there’s food present (or nearby). Jesus fed thousands from just a child’s snack, there was the Last Supper, Adam and Eve ate of the fruit, and ‘stuff’ even fell from the sky! Food is throughout the Scriptures, and we feel it not only held an important part of the story way back when… but it still speaks to us now. Working in close partnership with our Care Team, the Meal Team helps by taking the one thing we can do for you that everyone seems to like: we can feed you! Going through one of life’s big events can make even the smallest of tasks seem huge. Somehow, having a meal, or a series of meals, prepared and delivered can make all the difference in the world. Many have reported, “Wow! What a gift to not have to even worry about where our next meal was to come from… it just showed up!” This is a great way to get to know your neighbors and fellow New Song-er’s, not to mention a chance to express the love of Christ as you drop off a prepared meal for someone who would greatly appreciate it. Interested in serving in this capacity? You are always welcome to join us; some seasons have more needs than others, but volunteering for this team sets you up to make a huge difference in a very short amount of time.